HUNTS POINT — Their cellphone projected onto a giant screen, two young developers began firing green celery stalks at roving 2-D hamburgers in front of a crowd of avid techies on Wednesday night. But this newly designed app is more than a virtual food fight. “We invented ‘Burger Smack’ to inspire kids to eat healthy,” explained Amy Pinto, 15, who designed the app with Victor Rivera, 14. The pair of Bronx high school students was part of the inaugural Bronx Tech Meetup. It's modeled on the influential NY Tech Meetup, the long-running monthly gathering in Manhattan that now claims nearly 30,000 members and hosted early demonstrations by top tech startups like Foursquare, Vimeo and Tumblr. The Bronx event, which the organizers called the first of its kind in the borough, drew about 125 designers, investors, teachers and entrepreneurs eager to develop a tech community closer to home. 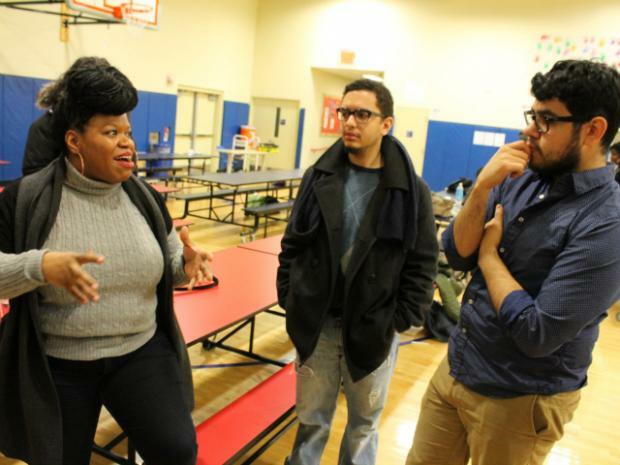 After a few presentations and app demos in the gym at the Hyde Leadership Charter High School on Hunts Point Avenue, the attendees split off to “crowdsource” ideas on posters and to talk tech. Unlike other tech events, which can be laser-focused on finding the next big startup, this one incorporated a social component as well — entrepreneurial gumption with a purpose. On the “Health” poster, a participant who signed their comment with a Twitter handle, @thembisue, suggested creating an app that points out healthy food options in The Bronx. Others proposed teaching girls to code, tapping into the tech talent at Bronx colleges and creating an incubator for startups that aim to improve communities. “I think there’s an amazing amount of pent-up demand for this,” said Denmark West, an investor and tech consultant who formerly lived in The Bronx. West listed several conditions that tech communities need to thrive — wired spaces, investor and civic support, online and word-of-mouth buzz and visible success. Several people pointed out that, just a few blocks away from the gym, sits the Sunshine Bronx Business Incubator — an 11,000-square-foot startup space in the BankNote building that houses about 40 budding businesses. Others said it is still a challenge to convince people — including Bronx natives — that the borough has the makings of a tech hub. “The credibility aspect is huge,” said Kent. Evelyn Alvarez, a designer in Port Morris, said part of the problem is that many Bronxites have the tech talent, but not enough time or resources to nurture it. “You spend so much of your energy just trying to live that it’s hard to be creative,” Alvarez said. One of the meetup's objectives is to spark more creative output in The Bronx, said Tina Shoulders, a Westchester-based graphic and textile designer who co-organized the event. “A lot of time we’re super-huge consumers, but not ... big producers,” Shoulders said. To address that gap, Shoulders said future Bronx meetups might incorporate workshops that teach participants how to code or use editing tools, along with demos by more advanced developers. Shoulders co-organized the event with Majora Carter, the local environmental consultant who recently launched a multi-pronged plan to revitalize Hunts Point, including a startup incubator of her own. Carter’s strategy calls for “harnessing the power of gentrification,” including by enticing tech developers and entrepreneurs to reconsider the Bronx — particularly successful locals who have left the borough. In its mission to attract tech attention to The Bronx, the event seemed to be an initial success — drawing a game designer from Nickelodeon, an executive from Viacom, a New York University computer scientist, as well as several Bronx high school students and teachers.